Coho are a very popular sport fish in BC. This species uses coastal streams and tributaries, and is often present in small neighborhood streams. 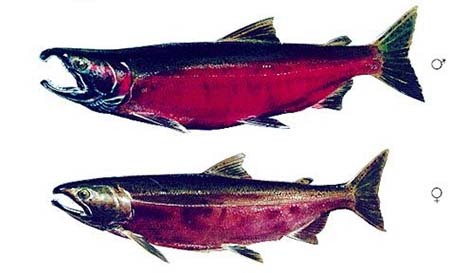 Coho can even be found in urban settings if their needs of cold, clean, year-round water are met. Coho spawn in small coastal streams and the tributaries of larger rivers. They prefer areas of mid-velocity water with small to medium sized gravels. Because they use small streams with limited space, they must use many such streams to successfully reproduce, which is why coho can be found in virtually every small coastal stream with a year-round flow. Returning coho often gather at the mouths of streams and wait for the water flow to rise, such as after a rain storm, before heading upstream. The higher flows and deeper water enable the fish to pass obstacles, such as logs across the stream or beaver dams, that would otherwise be impassable. Coho have a very regular life history. They are deposited in the gravel as eggs in the fall, emerge from the gravel the next spring, and in their second spring go to sea, about 18 months after being deposited. Coho fry are usually found in the pools of small coastal streams and the tributaries of larger rivers. When in the ocean; Coho Salmon feed on small baitfish such as herring, sardines, pilchards, needle fish and also on squid and shrimp. The average angler caught Coho Salmon is 8 pounds. The Coho is a strong fighter when hooked and can be very acrobatic. When Coho Salmon have completed the oceanic cycle of their life and have returned to their home estuaries, a great opportunity presents itself for fly fishing. Coho salmon can still be aggressive feeders at this time while they congregate in bays, estuaries, and river mouths before heading up the rivers to spawn. Fishing for Coho at this time is normally action packed and fast paced. Once they enter the freshwater of the rivers feeding will quickly slow until feeding stops completely. When these returning Coho Salmon start to congregate very productive methods for catching them is by spincasting with small spinners and fly fishing with bucktail flies. Coho Salmon hold in shallow waters at this time and fishing for them can be done from a small boat or from the beach with a set of waders. In many areas these holding Coho can be in as little as 3 to 8 feet of water. When looking for Coho watch for jumping fish and bait schools. Coho prefer slow moving, slack water and hold in shallow water staying clear of the more aggressive species like Chum and Chinook. When fly fishing for Coho use a 7 or 8 wt fly rod with a good 7 to 8 wt disc drag fly reel spooled with plenty of backing and a sinking tip fly line. Coho Salmon can be line shy so a longer leader that is 10 to 16 feet long and 12 pound test should be used. Set your drag on the light side as Coho can hit your bucktail hard and break off your leader if your drag is to tight. For Coho Salmon use 3 to 4 inch bucktails that are blue-white, green-white, polar, black-white, blue-red-tinsel-white, orange-white, pink-polar and blue-tinsel-polar. The Best Bait for Salmon – It’s a known fact that one of the best methods for catching Coho salmon with live bait is to use roe (eggs) in rivers or herring/anchovie in the ocean. You can purchase these types of bait or actually harvest and cure your own. For artificial lures, we recommend using spinners such as the Blue Fox. Learn to Drift Fish – One of the most up and coming methods for fishing for salmon is drift fishing. This is useful for river fishing for salmon, you basically cast your bait upstream and let it drift down over a pool or area where you think salmon are. This produces a more natural bait presentation to salmon. In slower river water; Spin Casting and Bar Fishing are the two best methods for river fishing for salmon.